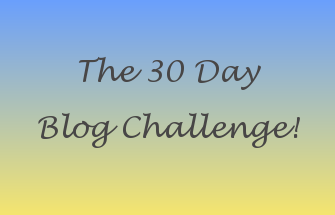 Hello and welcome to day 16 of the 30 day blog challenge and today the topic is looking at my 'lot in life' how I am working to overcome it. Now I should say that overall I think I am very lucky to have a pretty decent life, I have my family, friends, a job, a roof over my head and at the moment my health, but as I covered in a previous post I suffered a miscarriage about two and half years ago which still upsets me from time to time. Now I have already talked about the miscarriage, but the main focus of this post is the fact that I am coming to terms with the fact that I most likely won't have anymore children (as most of you know I am very blessed to already have a son) as my husband doesn't want to have anymore. Sadly although I thought I had come to terms with this, it would appear that this wasn't quite the case. A few months ago I found myself back at my GP's office in tears as I felt I could no longer cope with the grief I still felt and the fact that my husband didn't want anymore children. I should also explain that depression is not a new thing to me as I suffered from post natal depression after the birth of my son but was no longer taking medication at this point. The GP has put me back on anti-depressants and for the first time has suggested that I should undergo counseling as although I recognise the triggers as to what makes me depressed he felt that the underlying cause of these feelings needs to be addressed. By the time you read this post I will have been for my first assessment at the Healthy Minds clinic to see what course of treatment will be deemed most suitable. The medication is helping but every so often a situation will occur such as last week when my son declared he would really like a baby brother or sister and this caused me to sit in my back garden and cry. Sorry for rambling on and hopefully I will be able to give you an update soon on how the sessions are going and fingers crossed that they finally allow me to let this all go. PS A little update it has been recommended for me to try CBT so I am just waiting for my first appointment.